While I was surfing on the net today, I found this interesting way to advertise my website or blog. So easy, just PUT my ad on the Moon. The webmaster didn’t pay me a cent for its website mentioned in my blog, I just intend to share what I found, and perhaps we can think of something in similar way to make some dollars. 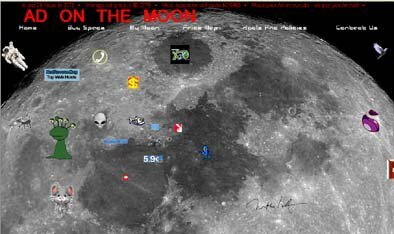 The total moon land of the moon they “Owned” cost about $2,778.90 ^O^, and the average cell price is $0.2779, Most expensive cell costs $0.5465. Tag: Advertisment, Moon, E-Commerce, ECommerce. glj: yeah, ads is everywhere now.